Copyright: © 2011 MCLE, Inc.
Print Book 688 pages in 1 volume (printed book) with downloadable forms Note: For print books, with MCLE's supplementation service, new supplements and revisions are mailed automatically with an invoice. If you do not want to subscribe, please check the opt out option during checkout. 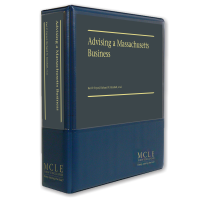 Advising a Massachusetts Business offers indispensable guidance on the issues business lawyers are most likely to encounter in providing ongoing counsel to their clients—ethics challenges; protecting proprietary information; employment, insurance, real estate, environmental, and antitrust issues; fiduciary duties of officers, directors, and business owners; and legal opinions. Editors Karl Fryzel and Richard Kimball led an outstanding team of contributors in assembling this highly practical, accessible, and thorough guide to the representation of Massachusetts businesses. We at MCLE trust that you will find this material useful in your practice and in your criminal law library.